Taking place within and around RedLine‘s 48 Hours of Socially Engaged Art and Conversation, the New Public Sites – Five Points Denver walking tours and immersive gallery map installation provided a range of opportunities for learning about and activating the power of public space within a truly beautiful, challenging and inspirational neighborhood. 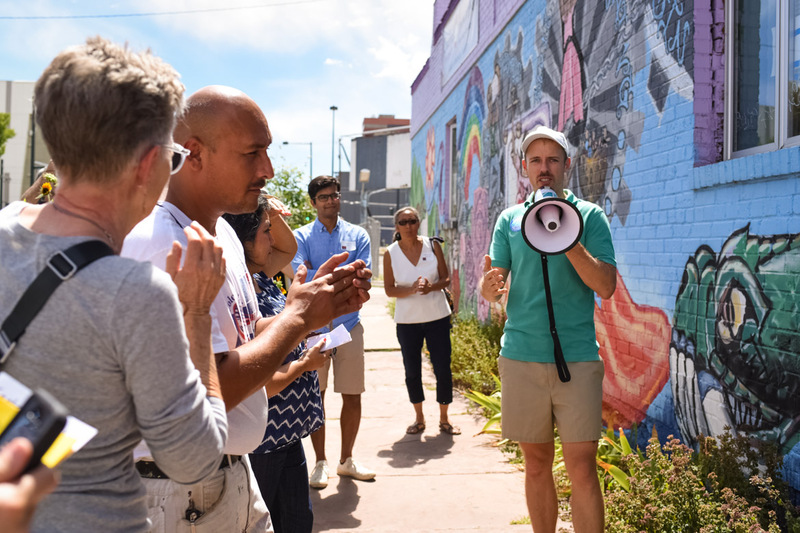 New Public Sites is indebted to RedLine, participants, and all of the guest speakers who through their time, space and energies made our roving spaces of radical pedestrian action possible. Click here to see photos of the tours and gallery installation! The project was informed by a range of interviewees and guest speakers. Interviewees included Tyrone Beverly, Beverly Grant, Lyz Riley, PJ DAmico, George Perez, Hadiya Evans, Julie Rubsam, Nikki Pike, and Celia Herrera. Guest speakers who generously donated time and energy sharing their Five Points experiences and projects included Centro Humanitario organizers Nancy Rosas and Judith Marquez, Blair-Caldwell Librarian Terry Nelson, long-term resident and RTD Title-VI Specialist Shontel Lewis, Five Points Fermentation owner Asia Dorsey, and The Temple Director Adam Gordon. I would also like to thank the entire RedLine staff for their hard work making these space of collective participation possible; including Louise Martorano, Libby Barbee, Whit Sibley, Geoffrey Shamos, Robin Gallite, and Misha Fraser.